Good. Creased Cover Creased Spine All items inspected and guaranteed. All Orders Dispatched from the UK within one working day. Established business with excellent service record. Jodi Picoult is an incredible writer; all of her books are inspiring and easily relatable. 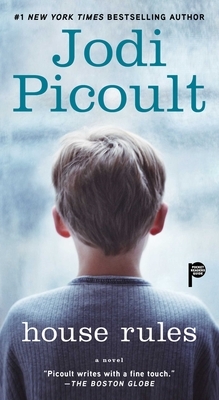 All of Jodi Picoult?s novels combine controversial issues and some sort of family drama. Controversial issues and family drama sum of the novel House Rules. The characters are both believable and can be related to if one has a family member with Asperger's syndrome. The beginning of the book reminds people that it can be an everyday struggle when you have a disability standing in your way. Life is not always a ?piece of cake? and can be a rough journey, and that happens to Jacob, the main character in the book. His family (Emma and Theo) tries to cope with his disability but it isn?t always easy. Asperger?s syndrome causes Jacob to be a social outcast and causes him to have uncontrollable outbursts. The whole way, I felt sympathy for Jacob until he commits a brutal act. This act causes stress to the whole family and puts a twist on the novel. But you have to read it to find out exactly what happens next. If anyone wonders what it is like to be a victim of Aspergers Syndrome or to be a relative of an "Aspie" this book will give you a very accurate picture. Beautifully written by Ms. Picoult who must have direct experience to have captured the challenging lives of her characters so truthfully. Plus the story is engrossing right to the last words. Very good story--gives a great deal of insight what an aspergers young man and his family go through on a daily basis. A real eye opener on this field of autism. Jody Picoult has combined medical information with true life in a laymans term. The story of a mothers son with Aspergers is heartfelt and honest. You will relate with this story if you have any type of health problem, special need or you are just growing older because sometimes we all feel singled out and attacked for no reason.